Considering the impact referees have on a game, they’re very seldom taken into account during pre-match discussions and predictions, only the occasional jest at Howard Webb’s affection towards United or maybe a slice of Mark Clattenburg related humour. Storylines are often crafted before a game between two rival players or managers, yet the biggest factor in creating home field advantage is rarely talked about at all. I guess the problem for most fans is that they think the referee’s a wanker, but exactly how much of a wanker is he? 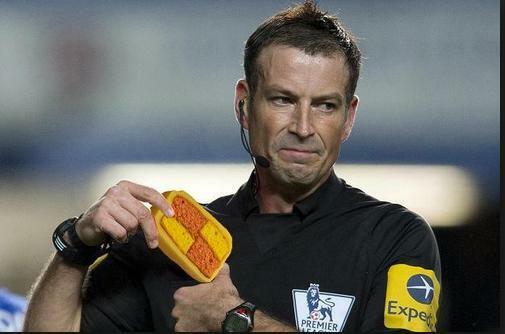 Let’s start by looking at the 7 referees with the most games overseen during the Premier League era. All officiating number are per game (“pG”). Here we can see that even when looking at referees with a large number of matches there is still a vast difference between how they officiate the game. There will be team effects in play for referees with few games officiated, but for these referees (all with over 275 games officiated) I’d like to think that they will have all averaged out and the differences are due to different refereeing styles. A two-tailed t-test on Mike Dean’s and Mark Halsey’s yellow card rates, which calculates the probability the two rates are the same, gives a P value of less than 2 x 10-22 showing how significant these differences really are. Notice just how conflicting refereeing decisions can be. Mike Dean gives penalties almost twice as often as Graham Poll did, and Mike Riley sent off players at more than twice the rate of Howard Webb. The next logical conclusion would be that the difference between referees obviously has a major effect on each team’s probability of winning specific games. I chose to compare the top 18 referees against the rest in order to get both samples as close to 50% of games as possible, but the effects are even more extreme if we just look at the tails. All rates are significantly different, for both tables, according to two-sample t-tests. Experienced referees seem to be more confident in their own decision making (Yeahhhh I know, I’m attributing something in football to confidence, sorry guys!) This means they are more willing to make an impact on the game and not “swallow the whistle”. I can imagine this effect will be even more prominent if an inexperienced referee was officiating against a big team or in a televised game although that’s just speculation. To show how referees make a difference we can look at how many bookings and penalties we’d probably expect home team to get based on possession and fouls and see how that differs from the number of bookings and penalties they actually get. I’m not going to go into a deep statistical analysis here, but just show you the numbers and let you see what you think. Here’s data for the Premier League since 09/10. You can see that home teams only have slightly more possession (possibly influenced by refereeing bias anyway?) yet officiating decisions fall heavily in their favour. Of course the higher rates could be influenced by home teams having more dangerous possession, but it’s difficult to separate this from officiating, and the swing does seem substantial enough that it doesn’t seem to be based on dangerous possession alone. How much of a difference do referees make? With a few calculations we can look into how much having different referees can affect the course of a season. I’ll calculate the number of goals awarded via penalties since that’s the most straightforward. Mike Dean awards .145 more penalties per game than Graham Poll used to. On average this will slightly benefit better teams since they tend to win penalties more frequently than lesser teams, although the major swing will be between home teams and away teams. On average home teams are awarded about 61% of all penalties, even though they’re only awarded 51% of all fouls! Penalties are scored at a rate of about 80%. If we assume these two referees are biased towards home teams at the same rate as average then we can convert the difference in penalties into the difference in goals these referees would cause between home and away teams. So on average Mike Dean would cause home teams to gain an extra advantage of .026 goals per game, about 10% of home field advantage, solely through his willingness to award penalty kicks. Over the course of the season you would expect him to give home teams just under 1 goal more than Graham Poll through penalties alone. Once you take into account red cards, yellow cards, other fouls, and offsides you can see how one referee or officiating team could cause a significant advantage for certain teams over the course of the season. 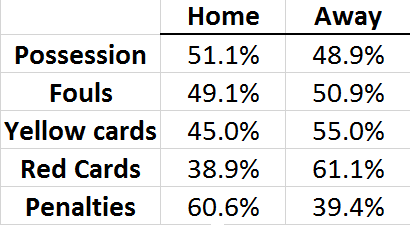 If a team knew certain referees were more/less home biased, then they could exploit this data even further. Encourage fans to be even more vocal: Hound referees when your opponent makes tackles, cheer when your team tackles, etc. Referees are more likely to make decisions in favour of your team if they’re under more pressure from the crowd. Obviously you couldn’t do this directly through the media or you’d get fined and most likely sacked. Also, just having more fans in attendance will likely lead to more pressure on the referee, so pricing tickets in order to maximise capacity is another option. Play more aggressively when an inexperienced, or more conservative referee is officiating your game, especially when at home. For example you could stop the opponent counter attacking, by fouling with a lower risk, or can be more physical when marking a player from a corner/free kick knowing you only have a low risk of giving away a penalty. If you have in depth data, you could go even further with this and slightly adjust tactics/squad choice based on each specific referee you get assigned. The whole point of sports analytics is to find little advantages like these and exploit them. There are signs of officiating manipulation in the NFL, so why not football? If each season teams could guarantee the prospect of adding 2 or 3 goals knowing they came through different forms of officiating exploitation, I’m sure most of them would grab it with both hands.